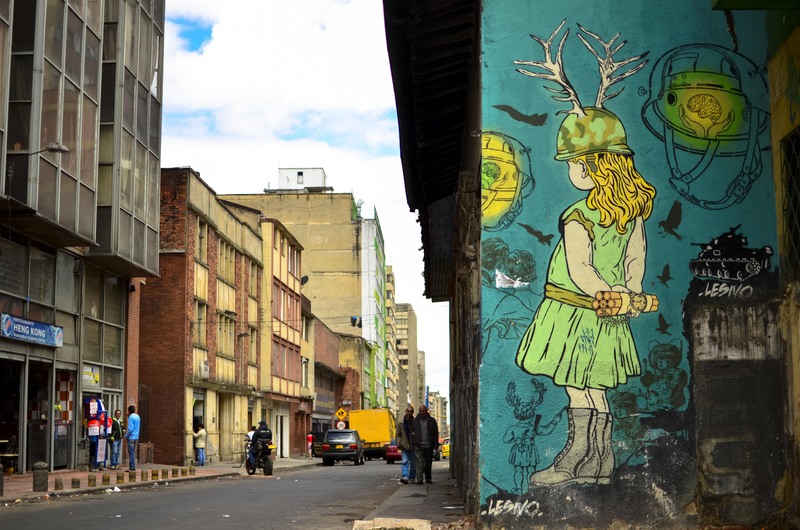 Having been through so many big cities in Latin America, we actually were convinced we should skip Bogota and move along. Large cities have their pros and cons, but for us traveling was more about getting away from the chaos that modernized capitals tend to have and striving to find the culture that is found away from the concrete and steel. 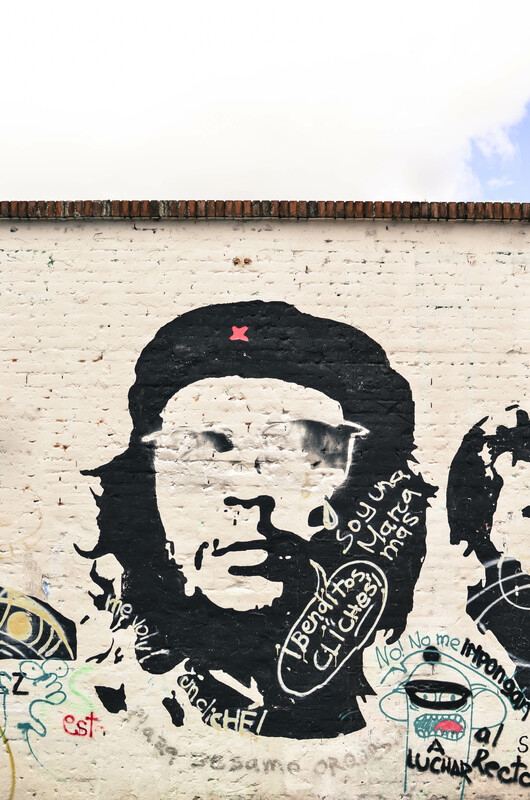 We eventually chose to visit Bogota with a fair bit of warning of the chronic petty theft scene that tourists attract. 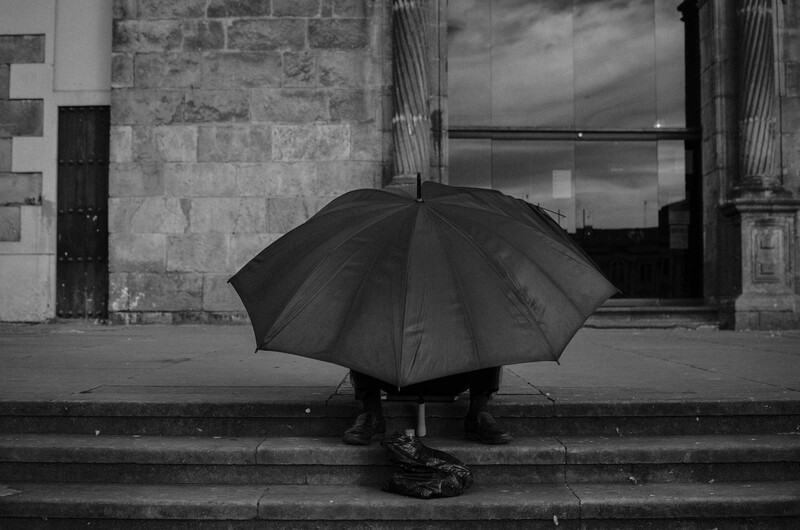 Like any modern city, the wealth gap between the rich and the poor is prevalent, and the poorer parts of society sometimes have a Robinhood-like view on taking visitor’s things for money. 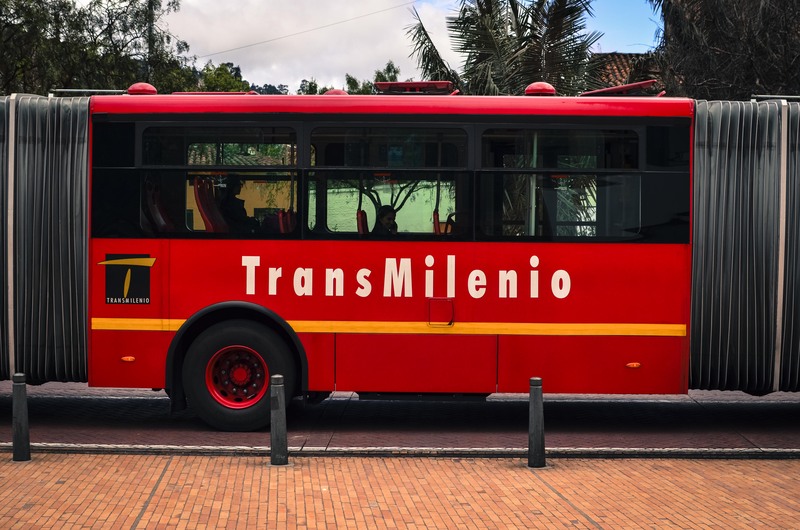 We had heard several versions surrounding the art of pick-pocketing on the transmilenial, armed robbers fashioning metal objects (guns sometimes too), and drug addicts trying to finance their next ride shaking down easy targets. 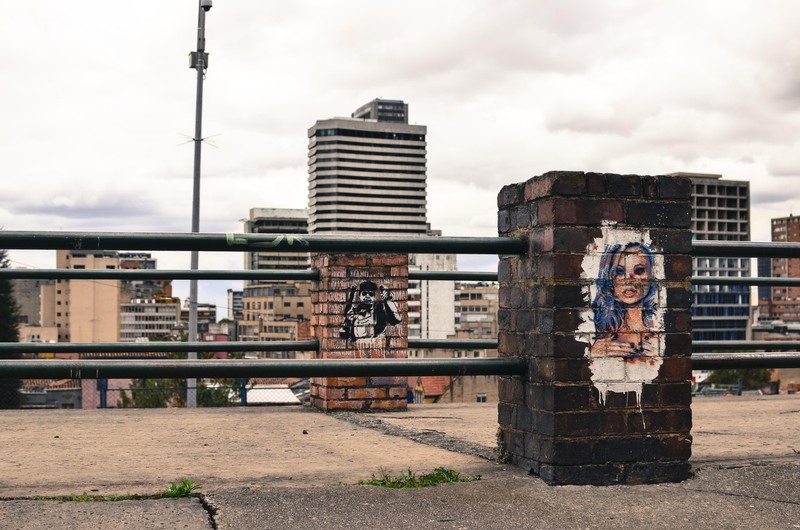 Robberies are not unique to urban environments in the developing world (crime is in every city), but it seemed like we heard a lot of stories about Bogota and kept that in mind prior to arrival. Bogota is enormous. The ride from the outskirts of the city limits to the bus station took around 40 minutes. It was pouring rain when we arrived, so we watched with curious eyes through the wet windows of our bus. Gloomy, grey clouds hung over countless gloomy, grey buildings as urban sprawl was defined in front of our eyes. At the bus station quickly found the taxi line, which whittled itself down at a snails pace. Our ride to La Candelaria brought us whizzing through the belly of the beast. Areas became distinguishable with blocks businesses all offering the same products. 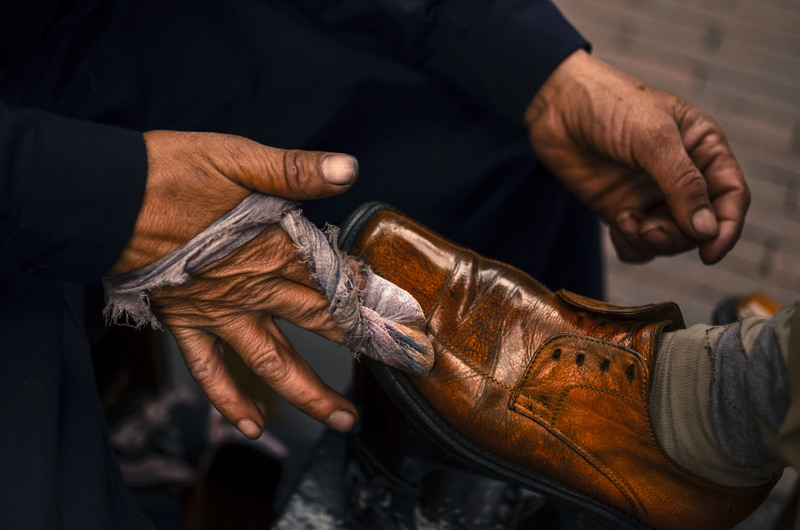 There were 3 blocks of dentists in succession, 2 blocks of high density optician outlets, 3 blocks of stores that sold nothing but shoes, 4 blocks of stores retailing electronics, and a decaying strip consisting of housewares, textiles, and clothing. 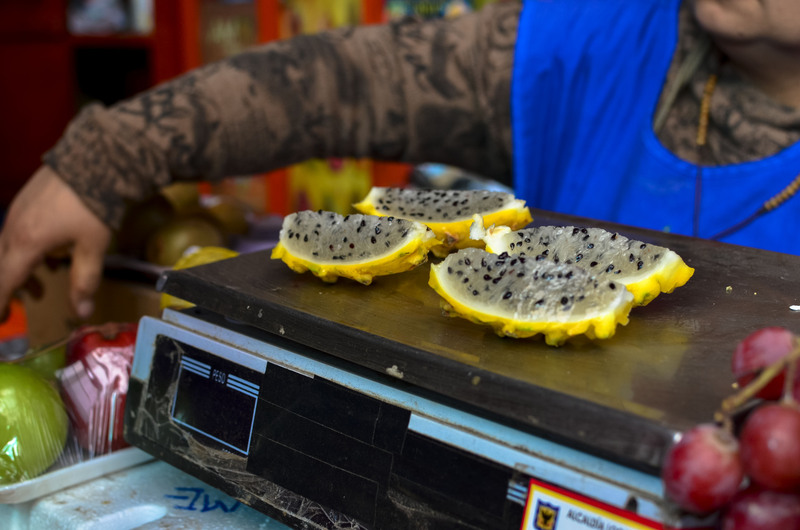 The trend in Latin America seemed to be that stores offering the same goods seemed to cluster amongst each other, creating a competitive market place with very little distinguishing one from the other. 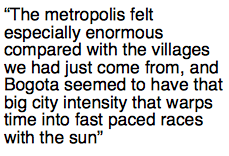 The metropolis felt especially enormous compared with the villages we had just come from, and Bogota seemed to have that big city intensity that warps time into fast paced races with the sun. Cities operate on a different rhythm, and tend to skew time to cover their own insecurities with their interaction with nature, in my opinion. They are breeding grounds that spawn competition amongst ourselves. The image you find in the mirror when you get caught up in city life can be a very different one than what you see in the reflection of mountain lake high up in the Andes. You can find yourself filling your day with intangible accomplishments, goals, and comparisons about what you have versus others around you. This is one thing that cities have in common amongst each other no matter where you are in the world, and is another reason why we didn’t find ourselves spending lots of time in them on our travels. But cities are also common space for creative thinking, artistic expression, and societal evolution. Millions of people interacting with the walls they’ve built and the markets they’ve made are what keeps us coming back to them. And there we were at 8,600 feet in the mountains seeing Bogota for the first time. 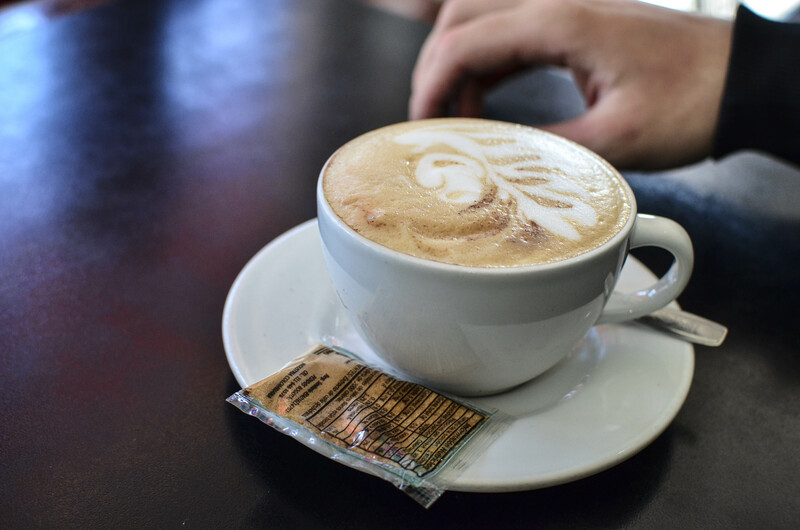 We settled into a popular hostel option that offered a kitchen and a somewhat reasonable price in La Candelaria. It was another expat business that was taking off; it catered to the growing demand for “high class” budget traveling, offering tours, wifi, a connected gourmet restaurant, and heaps of people. 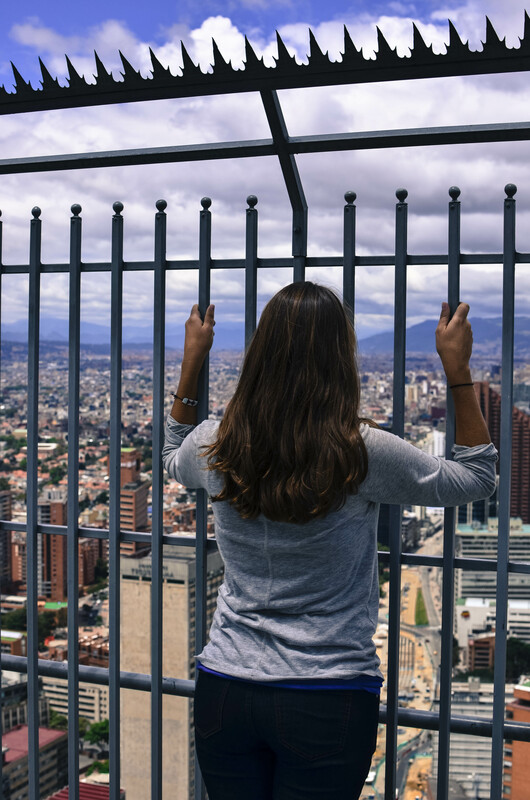 Determined to find other lodging options, we decided to take a stroll around Bogota that night and see what the city had to offer. A chance meeting with a travel buddy we had spent some time up in the mountains with got us into a new hostel that hadn’t made a name for itself yet, and offered better accommodations at a better rate. Score! We explored our immediate surroundings of shops and restaurants, which appeared to cater towards tourists and college students. Delectable dishes, trendy bars, and public performances were just a short walk away in just about every direction. 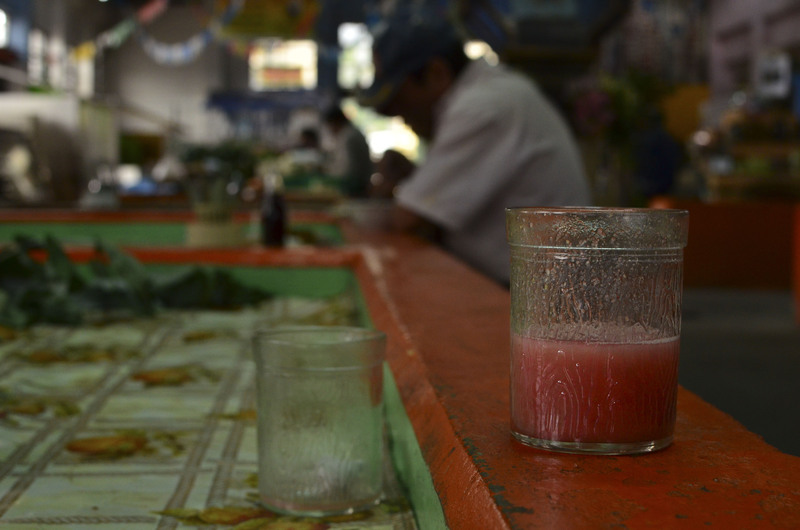 Local treats like Chicha (corn based drink fermented with spit originally from Peru) and hot chocolate with cheese could be procured at a moments notice as well. It didn’t take long for us to locate the local mercado to fulfill our insatiable appetite for Colombia’s set lunches. 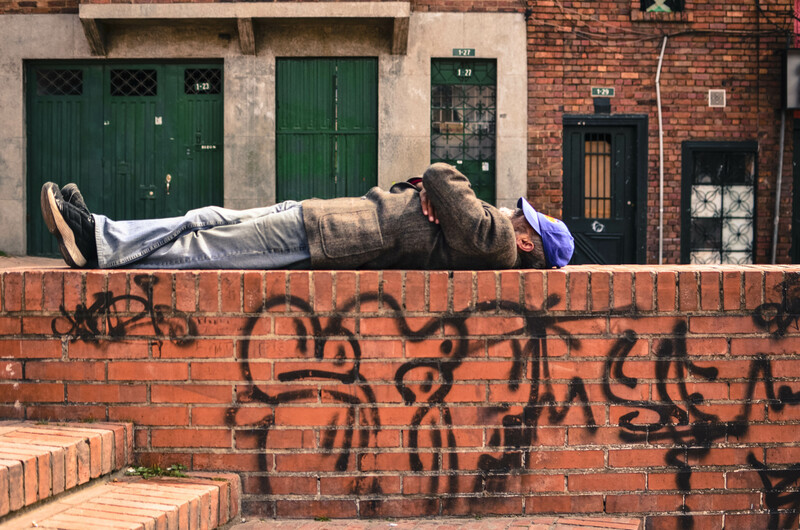 For those that have ever walked along the streets of Bogota outside of La Candelaria at night, you probably can relate to feeling of constantly looking over your shoulder. After breaching the invisible barriers of the historic part of town, we noticed that operational street lamps became sparsely present. Streets appeared to be completely abandoned after the sun went down, with dark alcoves and dimly lit intersections in large dosages. We heard about a movie theater within a 15 minute walk from our hostel, and every person we asked directions for sent us a little further out with no theater in sight. It felt like a game, and a serious one at that. Police officers with enormous Rottweilers, probably the biggest I’ve ever seen, would appear out of nowhere garnished with large guns swinging from their shoulders. The occasional glance was often met by a look as if asking “are you two lost”? The occasional drunk and drug addict would shift our sidewalk positions to the other side of the street while we hunted for the theater. Eventually we discovered it only to find out that all interesting movies were in french with Spanish subtitles. Instead of an hour and a half of playing “What did he just say” we went back towards the main streets and scored the best sidewalk pizza a dollar could buy. 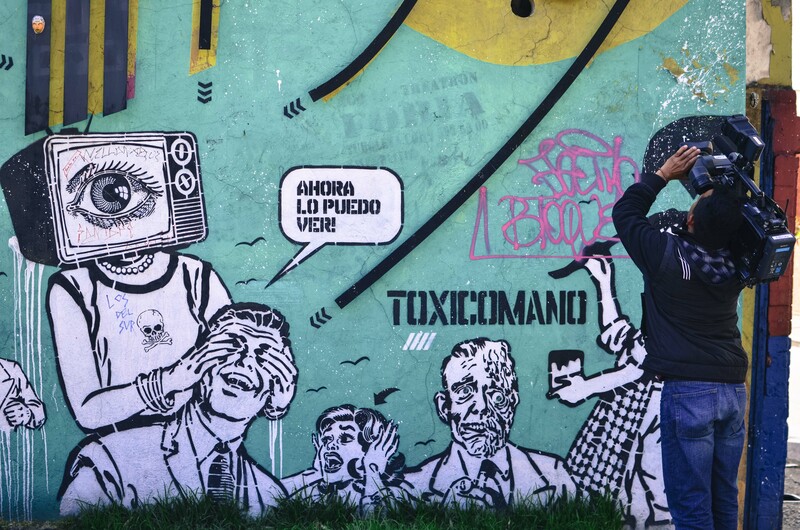 We drifted back through La Candelaria, admiring the graffiti covered walls at night and the crowds of inebriated college students swallowing stairs in public squares. 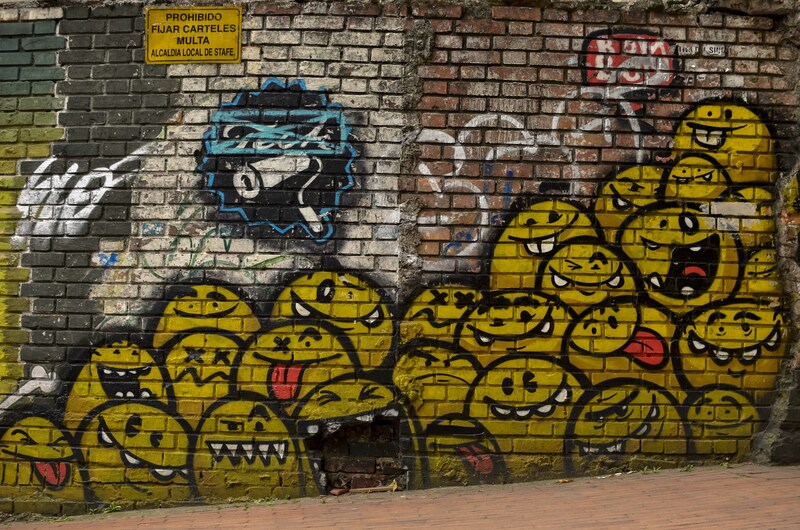 While graffiti isn’t technically legal, it’s a form of expression that has overtaken the entire city of Bogota. A lot of the works are politically driven, and some are solely based around beautiful art from the mind of their creators. 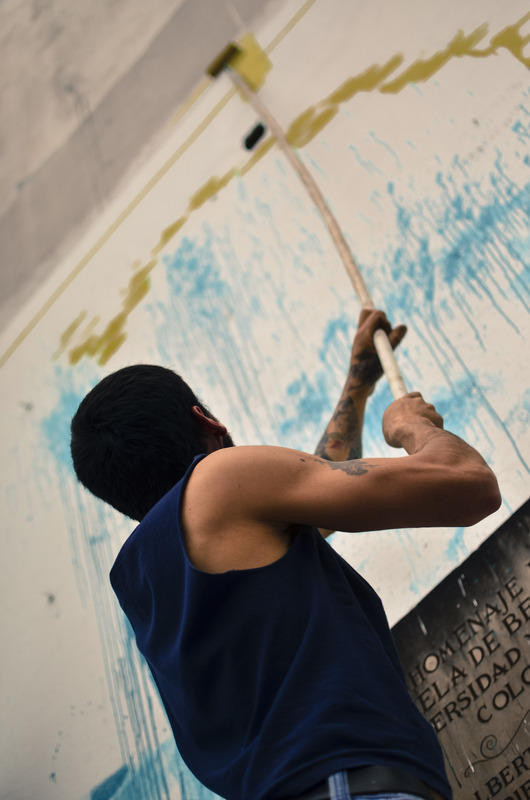 Large public walls are interactive billboards in this urban landscape, and these walls go through cycles of change as artists paint over older works and give their version of expressive interpretation. 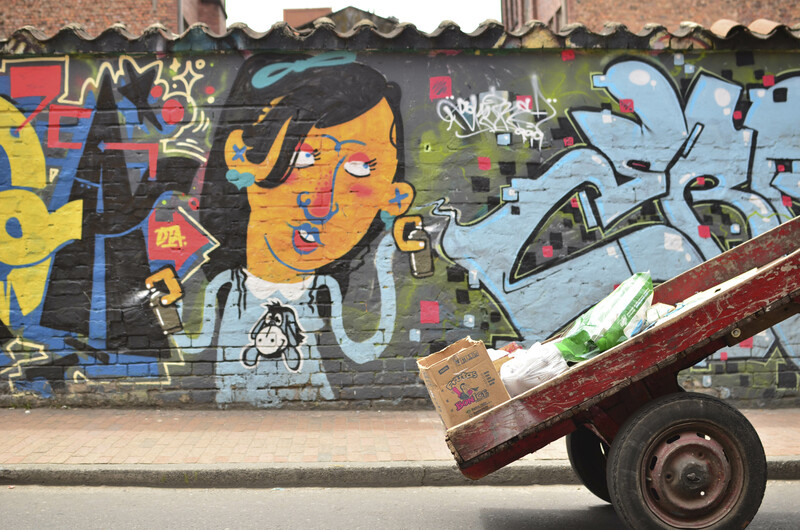 La Candelaria is a breeding ground for colorful canvases, but artists’ messages and images are also found throughout the entire city. 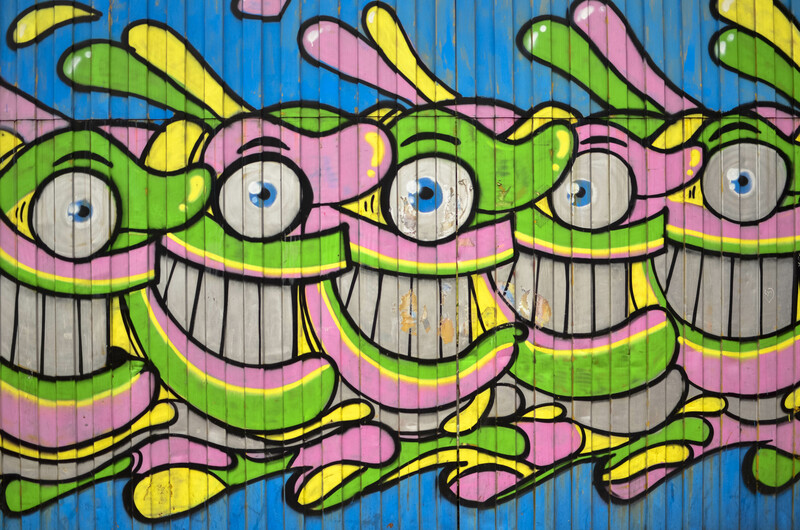 In order to understand how graffiti became such an omnipresent part of Bogota, we booked a free Graffiti walking tour by an expat street artist from Australia named Christian (http://bogotagraffiti.com/). 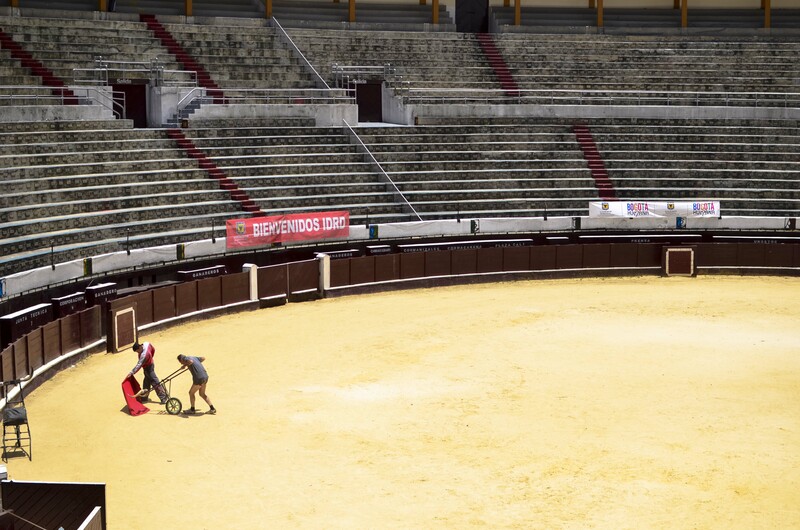 To our surprise, it happened to be the same day a local Bogota news station was filming a story about the tour. 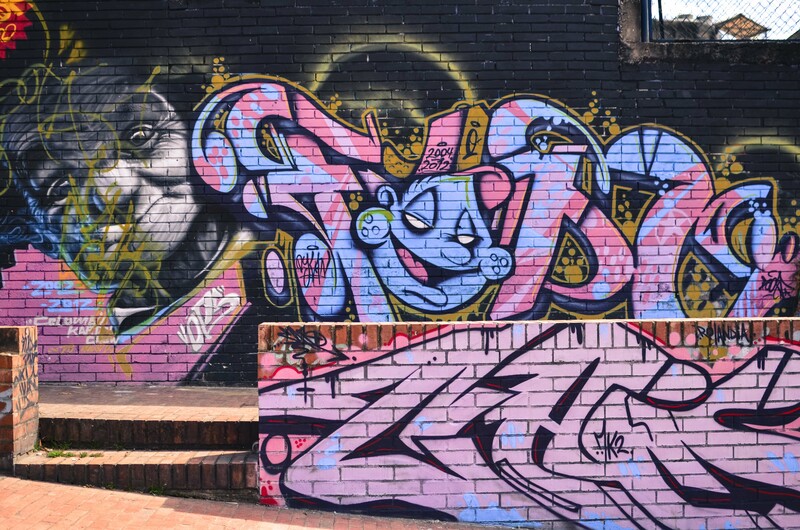 Christian educated us on why Graffiti was so prevalent and important to Bogota, and went through the historical relevance of early works by crews and the significance of the works that we had been walking past every day. Christian was very knowledgeable and very much involved in the scene, showing some of his own works amongst legends in the street art world. He explained how the unspoken rules worked (kind of) and gave examples of young kids who didn’t realize the work they were defaming, as some pieces are meant to stay untouched forever and some are “open game” for anyone to play with. The TV crews joined up with us about halfway through the tour, and asked for shots of us walking in front of the pieces, around Candelaria, and down dusty streets. 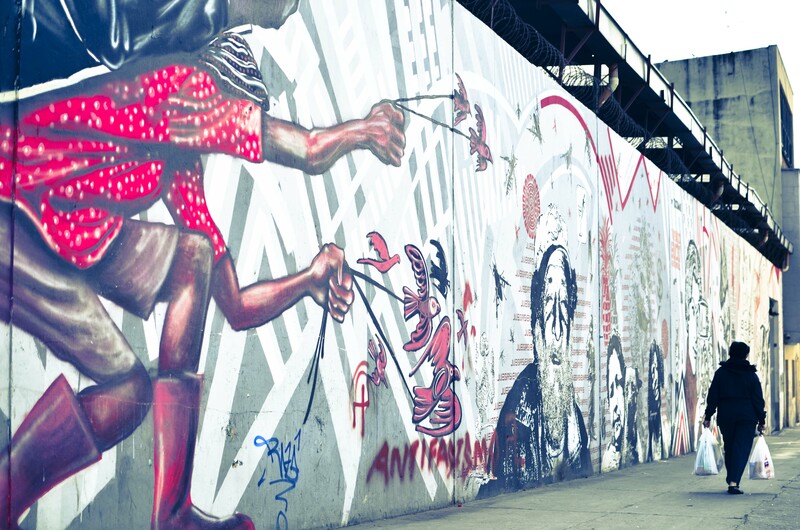 Somewhere out there, we are tourists walking in front of painted walls in internet land. 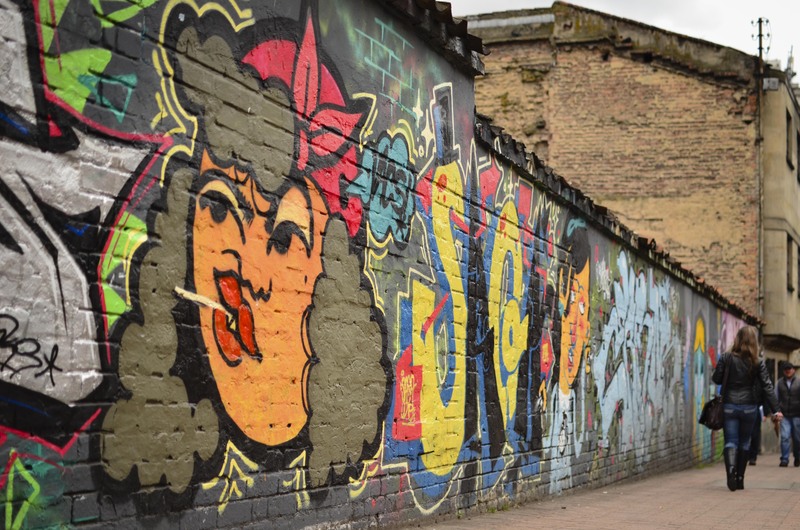 As any form of public expressionism, a lot of political unrest birthed the outpouring of murals and color splashed scenes depicting anger and frustration with the government. 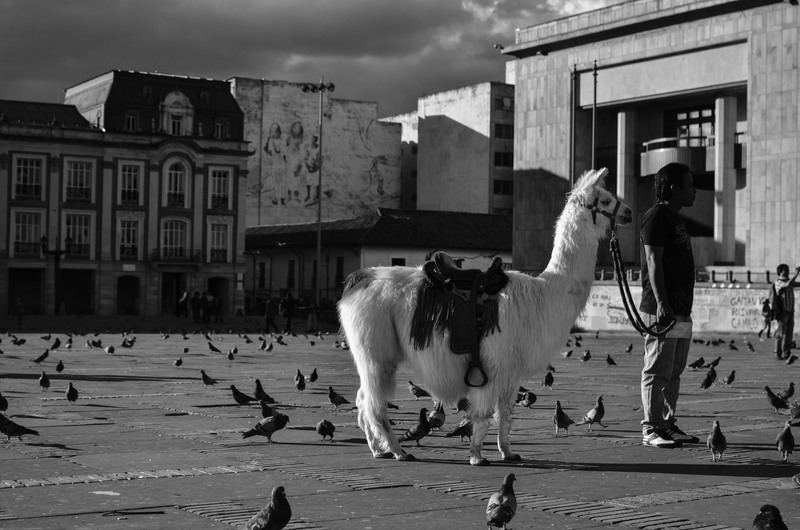 Bogota has had a very violent past, and a walk through Plaza de Bolivar will take you directly into a living scene of public outcry. Paintball splashes cover architectural treasures such as churches, statues, and the courthouse, where members of the M-19 army held the court hostage and executed over 20 supreme court justices (and rumored to have destroyed evidence against the infamous drug kingpin Pablo Escobar). 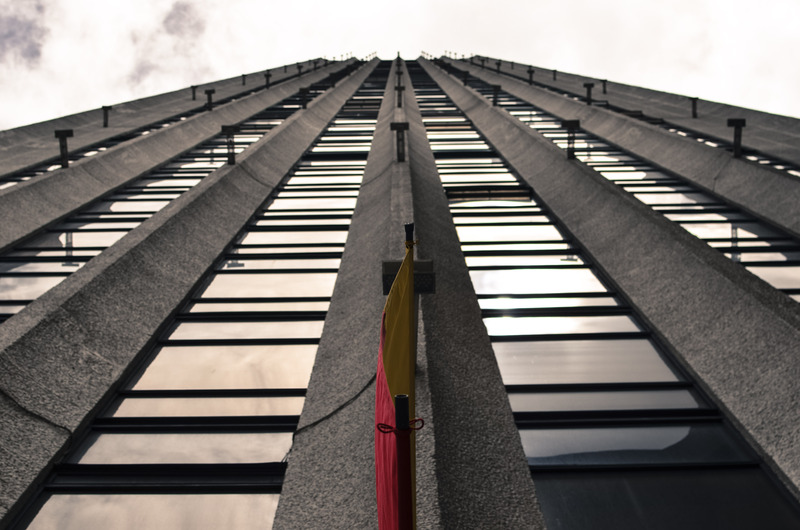 Physical damages are preserved and can still be seen on the exterior of the building to date. During El Bogotazo in 1948 3000-5000 Colombians died, thousands were injured, and much of downtown destroyed in the chaos after the assassination of a presidential candidate. 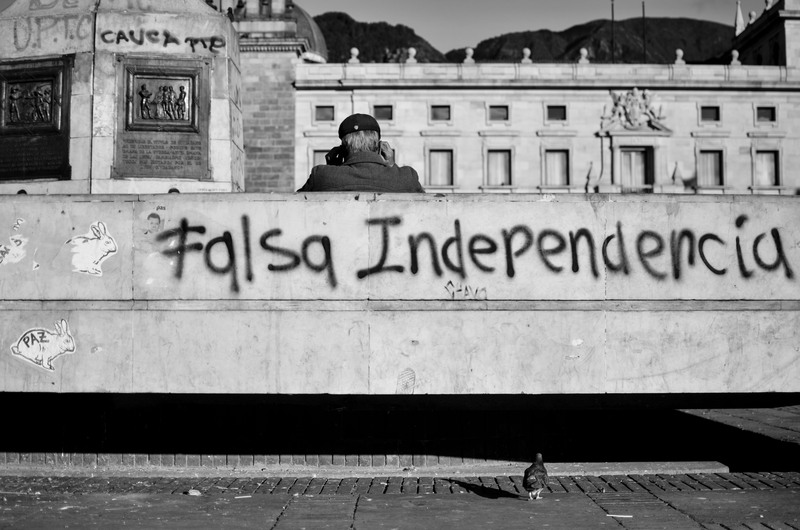 Bogota has a history of anti-government opinion, and with many reasons backing those thoughts from the frustrated citizens. Our friends Brook and Jason, who joined us during the first leg of our Colombia explorations, highly recommended a bike tour of Bogota through Mike of Bogota Bike Tours (http://www.bogotabiketours.com/). It wasn’t hard to find his shop, and we signed up for a late morning ride the following day. We met Mike at his shop with another excited tourist not knowing what kind of operation would ensue. We had been observing the chaotic traffic for a few days now and wondered how this was going to shake out. It turned out to be a game of follow the leader through Colombian city traffic, which might not be for the faint of heart. 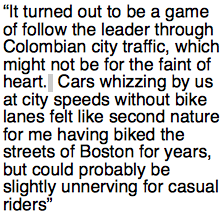 Cars whizzing by us at city speeds without bike lanes felt like second nature for me having biked the streets of Boston for years, but could probably be slightly unnerving for casual riders. Several times we were separated from our fearless leader by stoplights, but everything turned out well in the end. 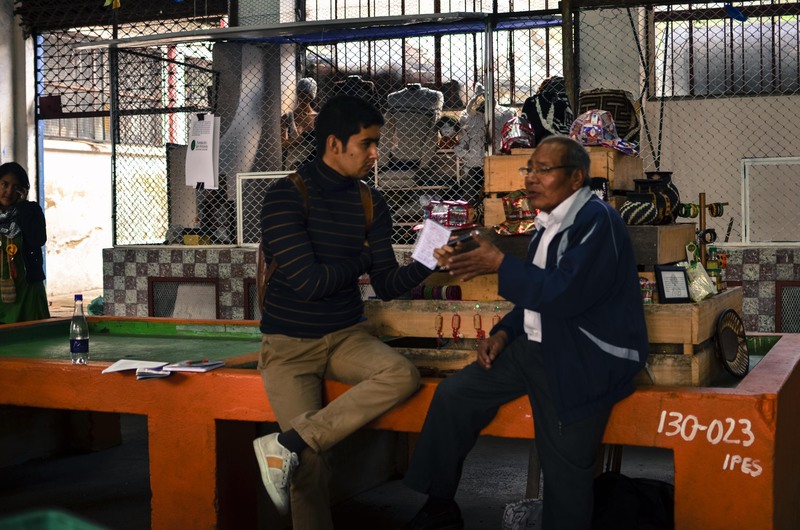 Mike moved to Bogota to pursue journalism, which he still does, but his bike tours are his bread and butter now. In a few short hours Mike brought us to parts of the city we would have never known. 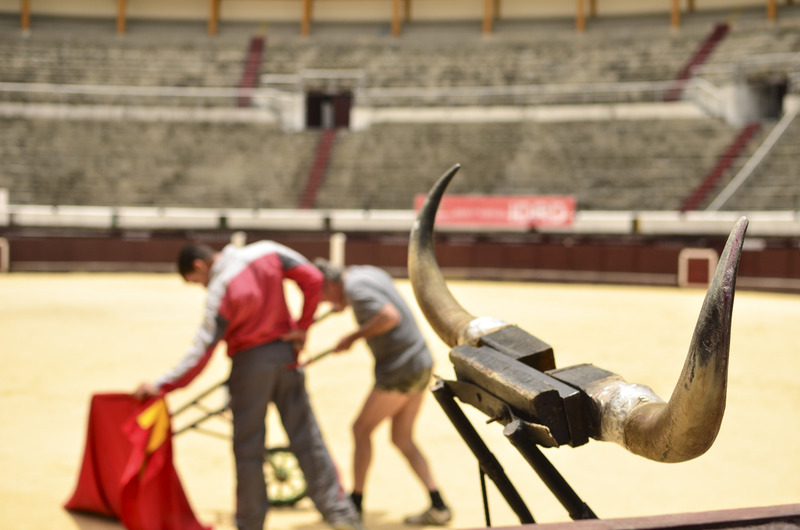 He brought us into the Bogota’s controversial bull ring, a sign of the past in a city of the present, where bull fighting is still preserved and practiced. We had a sneak peak at a training session, complete with loud grunts and groans of perfecting poses from both the trainer and the trainee. 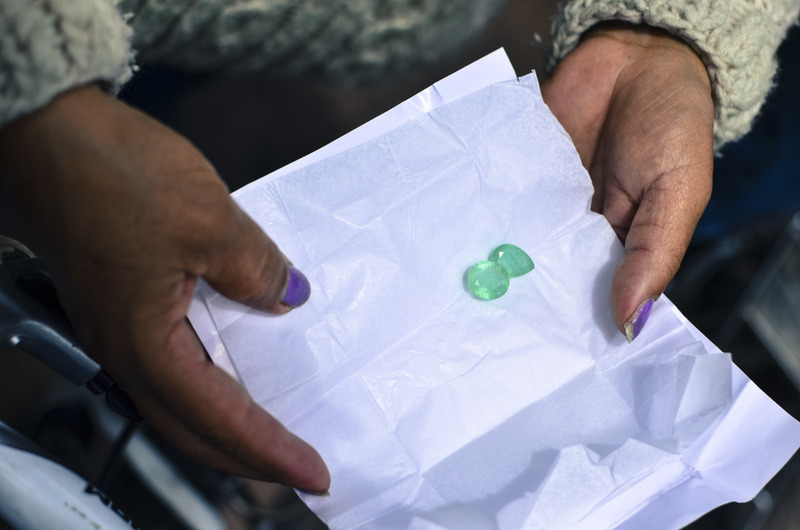 A visit to the black market for Colombian green emeralds led us to encounters with throngs of Colombians trying to sell rough emeralds (and fake emeralds to unsuspecting tourists) curbside. A spin up into the hills brought us to a beautiful park with warnings from Mike about being aware (he’s been on tours before where people were knocked off their bikes and robbed, both of belongings and bikes: Jason and Brook’s tour was interrupted by a Colombian welding an ice pick and demanding cash) that we are in Bogota and Bogota-like things can happen even in pretty parks. 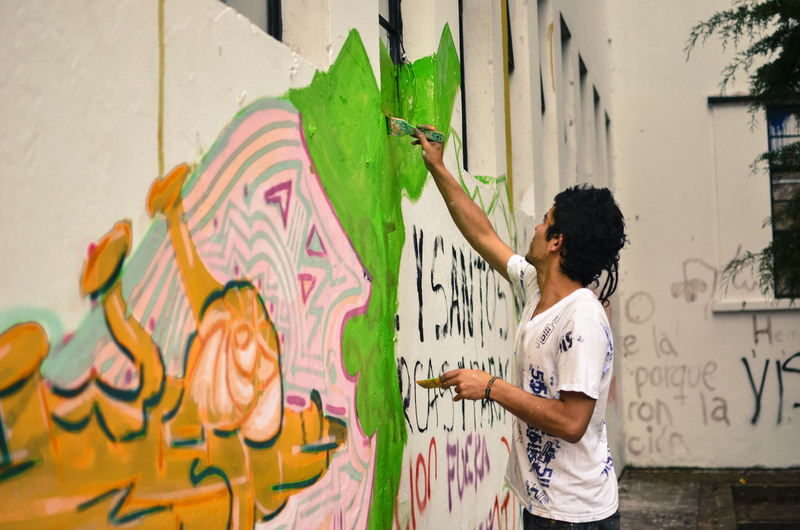 The tour brought us to the National University of Colombia where public art is allowed on most buildings, and most buildings are covered by it. 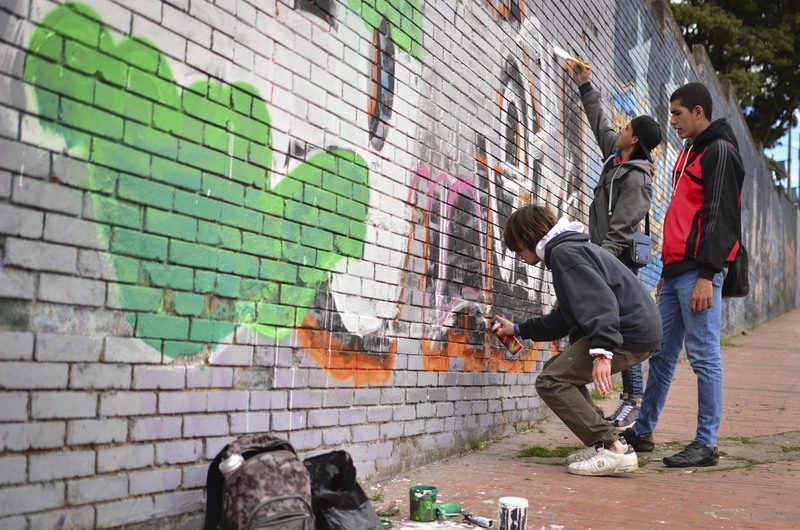 Our visit happened to be during an art exhibit, so there were groups of students painting the outside of the art building, which is something I’ve never personally witnessed at a school (allowing students to cover a building with art). Mike also brought us into the Red-Light district, where prostitution is very legal and very present. This is not recommended by me unless you are with a group of bikers, but was very interesting to see in broad daylight within a city. 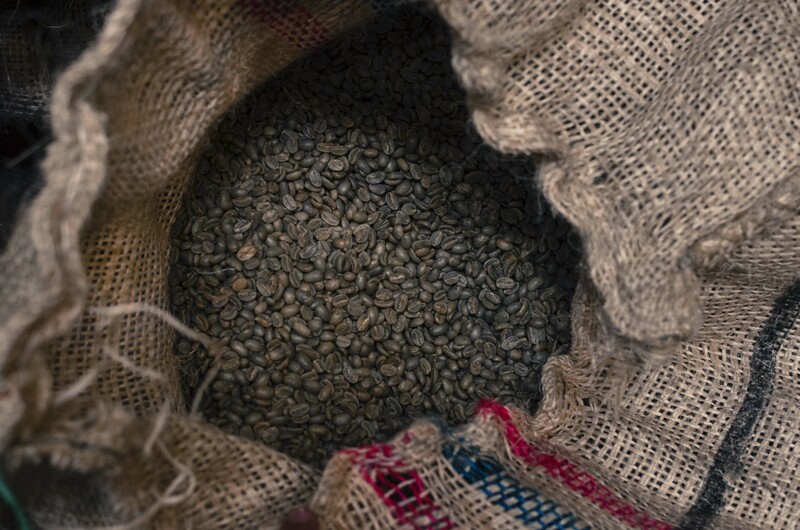 A quick trip to a coffee shop showcasing Colombia’s finest legal export wrapped up the tour before heading back to his shop. 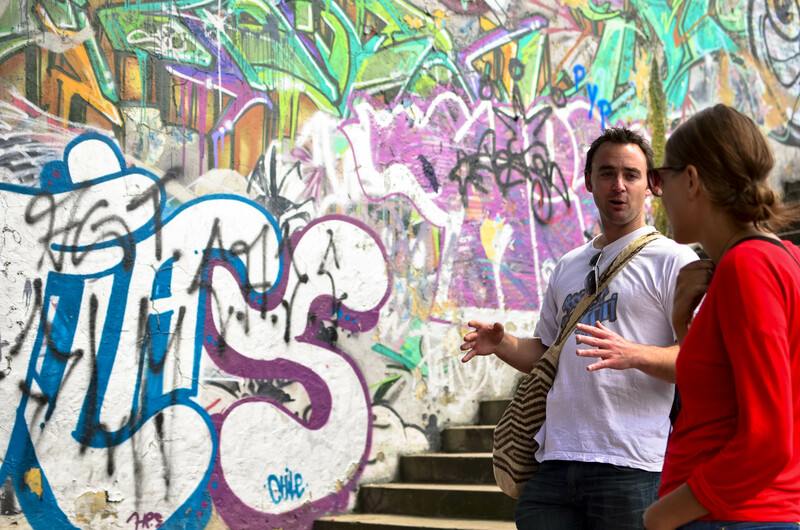 I highly recommend using Mike’s tour if you want to get a real look at Bogota. 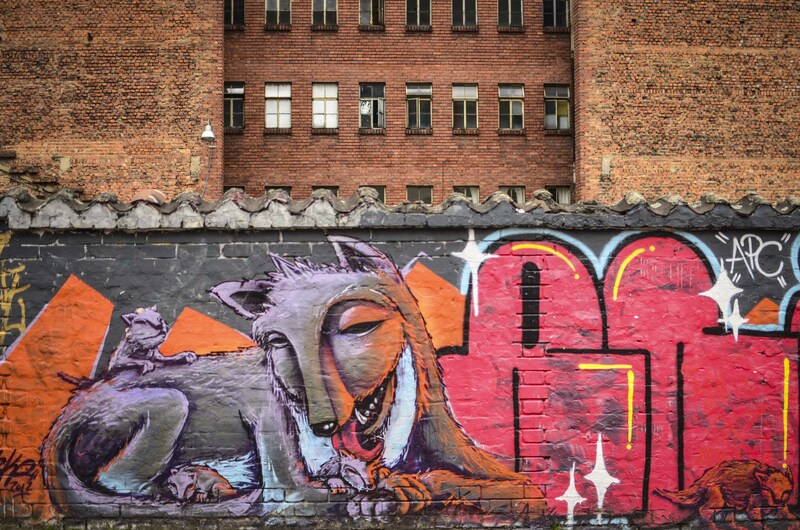 Finding charm in Bogota’s city limits is very easy if you look in the right places. We found an inspiring couple inside that hostel that had been traveling together on a motorcycle from Kentucky. Bob and Rebecca spoke about their journey and we connected instantly. 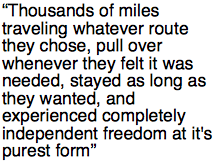 Thousands of miles traveling whatever route they chose, pulling over whenever they felt it was needed, stayed as long as they wanted, and experienced completely independent freedom at it’s purest form. It’s refreshing to meet travelers who are experiencing something bigger than just checking another destination off the list or just partying in a different place for kicks. We all shared our Latin American travel experiences and all truly understood exactly what everyone was talking about. If you have a minute, check out their journey at www.becandthebeast.com. We made some plans to meet up in a week down the road and hoped that it would come to fruition. Elissa and I also found out that we happened to be living directly across from a hookah lounge that offered comfort food, wine, and big comfortable floor pillows in cozy candle-lit rooms. Small restaurants were scattered throughout the safer parts of the neighborhood for nighttime entertainment. Public story telling is a tradition, and crowds gather outside of a church where you can enjoy stories if your Spanish is up to par. 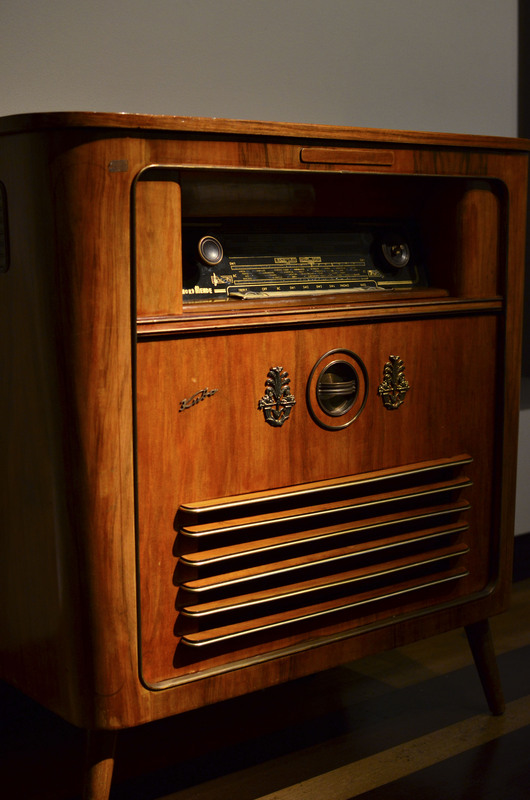 Sundays offer a wide array of flea markets and traditional goods shopping, as well as street food options everywhere. 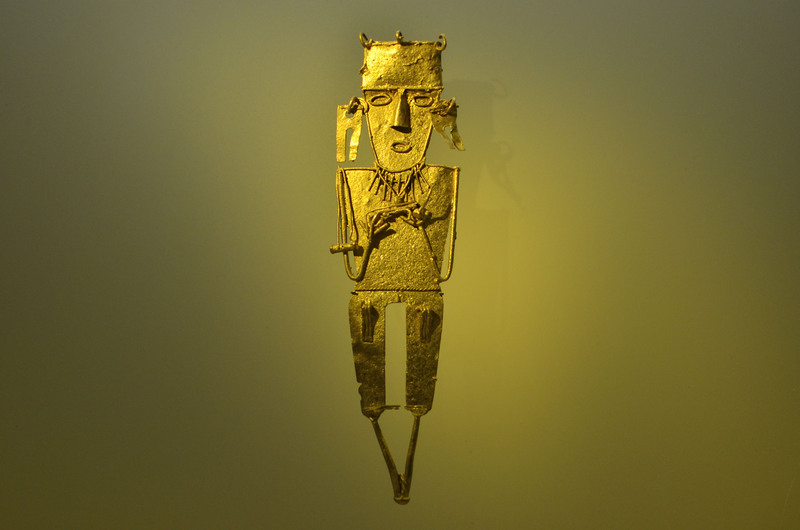 Bogota has amazing museum options, with a wide array of free public galleries to chose from. We got up close and personal with Botero and his masterpieces, observed the history and of gold and the role it has played in early to present civilization at the Museo del Oro, and walked along the walls of another free museum that is escaping my memory at the moment. 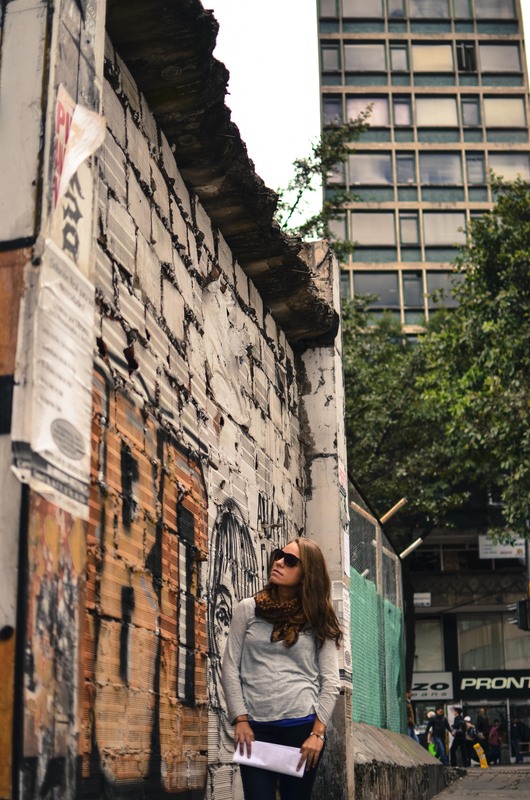 We wound up staying in Bogota for almost a week, despite our attempted aversion of the concrete jungle. Our next stop appeared to be yet another city that we couldn’t stop hearing enough about that was an overnight bus ride away. 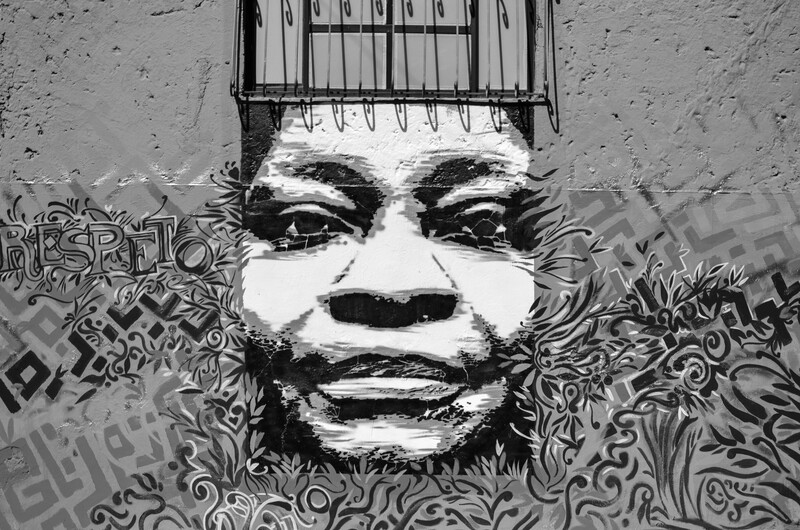 Before long we said adios to Bogota and woke up in Medellin. Aloha! 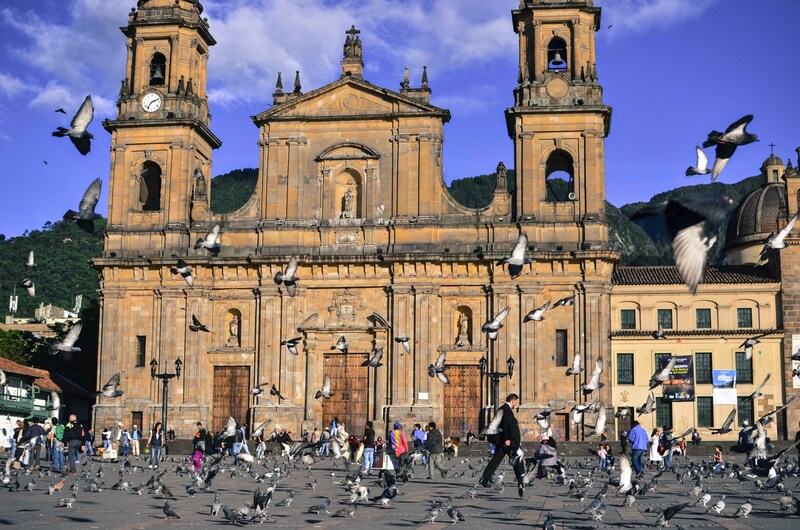 getting away like that is good for the soul…I would love to visit Bogota one day. Sometimes, the road less travelled offers surprise adventures. This is some great writing. The layout is very easy on the eyes and flows real smooth. 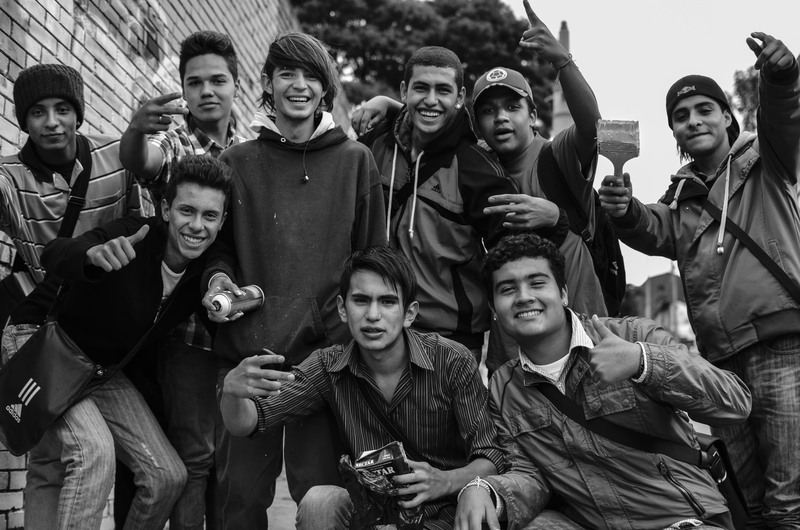 Wow, your pictures are amazing and you wrote so descriptively about Bogota I almost felt like I was there! Almost. Might have to actually go there to remedy that situation! 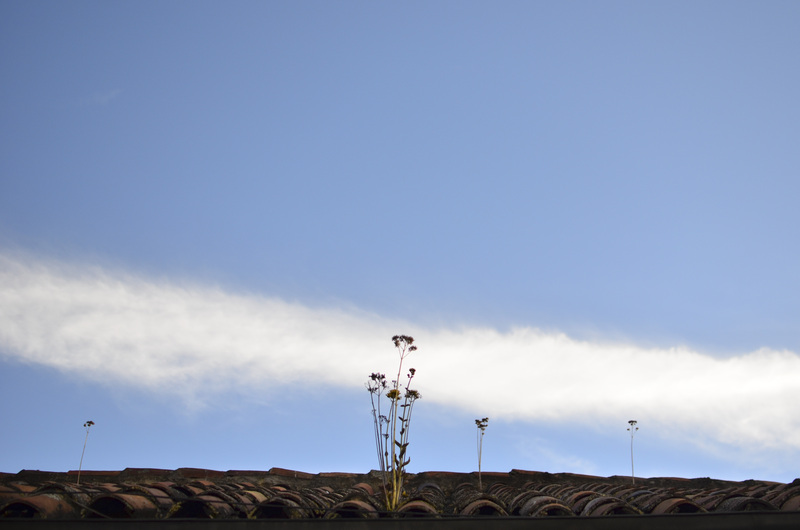 Amazing pictures, the 1st pictures really captures the sky in Bogota. I just love your pictures. You really have the eye for good subjects. Your photos are absolutely brilliant. I’m heading into Bogota in April for a wedding, nothing I’ve seen so far has set it in a light like you have. Yes, I love your pictures too! Looking forwards to more! Excellent post about a one-of-a-kind city. Wonderful pictures. 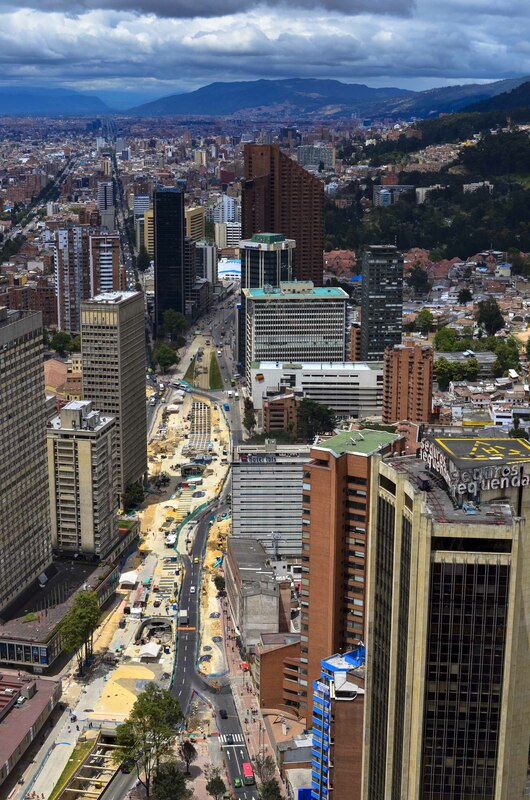 A couple of years ago I had spent a few months in Bogota and my flat was in Macarena, very close to the skyscrapers in the first photo. 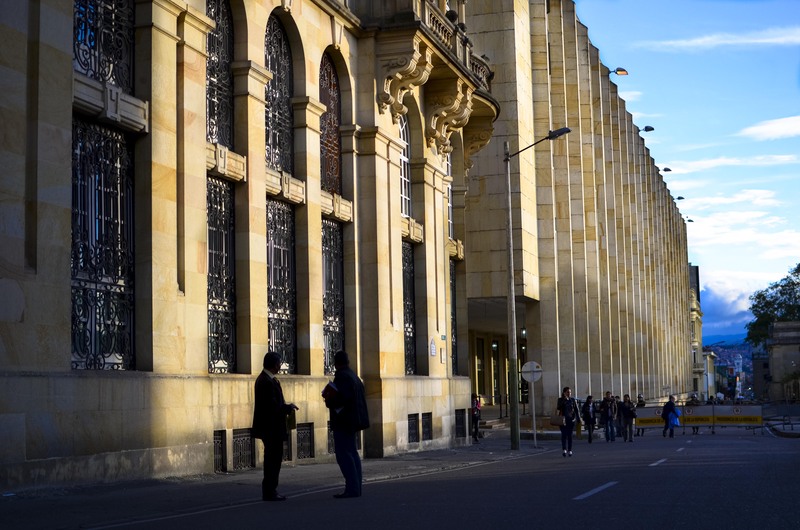 Love Bogota – there’s so much character in this city – both the people and the architecture, and think you captured it just right. Can’t wait to be back there some day. Great article! 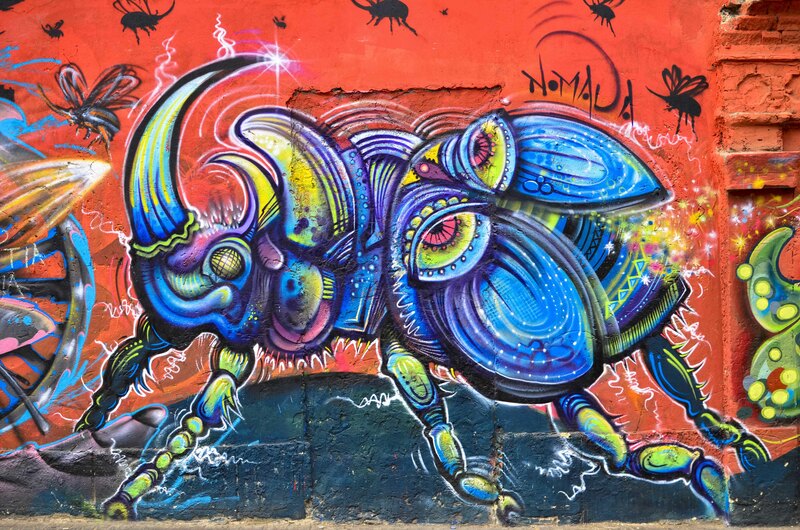 We’re in Bogota right now and I’m keen to do the bike tour and graffiti tour! 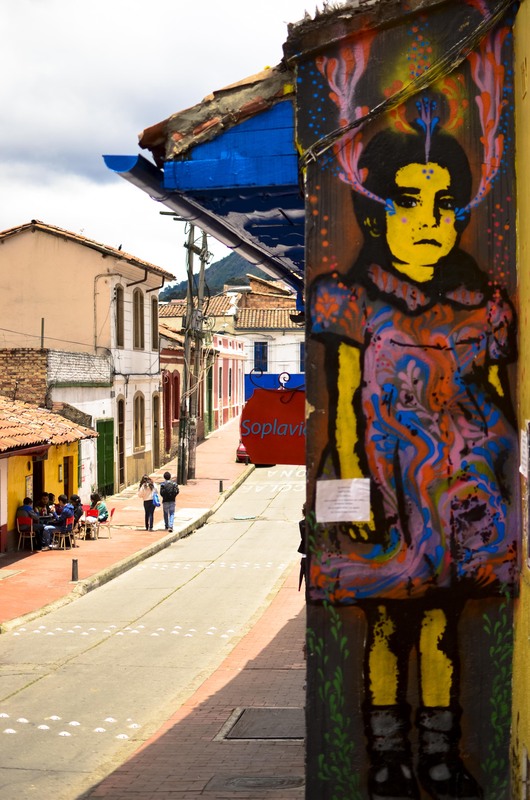 I’ve always wondered why tourists insist on staying in La Candelaria. 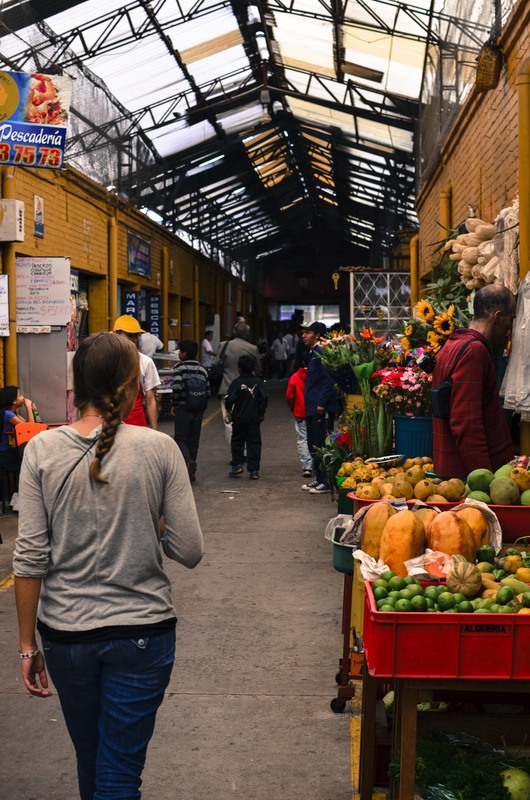 The place is even foreign to us Bogota natives, people go there on day trips, but most Bogotans prefer the nicer parts of the city – La Candelaria is kept that way because of its historical significance but it’s not an accurate reflection of life in Bogota. 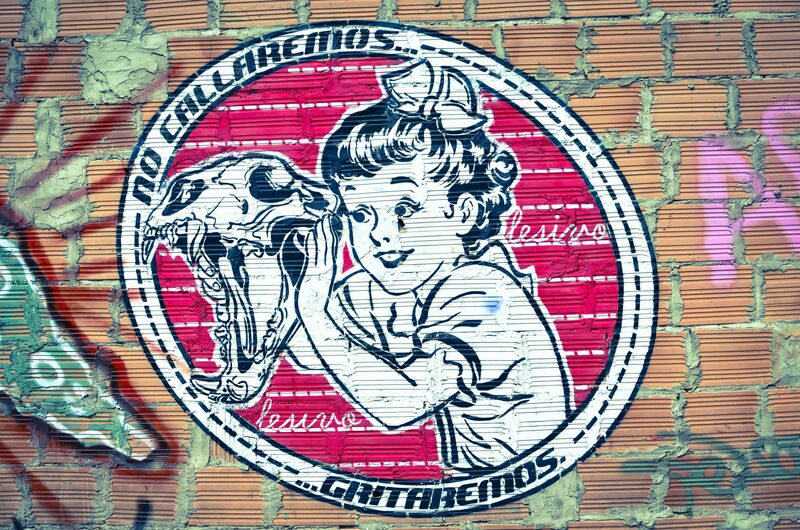 It is a pretty interesting place though, I remember going there as a high school kid to see the cute “cuentero” (story tellers) usually university kids who did stand upand were famous for it in Candelaria.